"Last minute is the best!" - Words to live by from a dear friend who popped in today after a quick flurry of back and forth messages. We were scheming a goodbye rendezvous before her departure for an extended adventure and suddenly “right now” became the best and only time to meet. Luckily, this spur of the moment get-together happened in the middle of our grilled-pizza-obsession phase, which was sparked by a continuous search for meals that won't heat up the kitchen during the hot summer. A grilled pizza’s thin, slightly charred crust is as close to making wood-fired pizza at home as you can get. Better still, it can be a vastly different experience each time you make it, depending on your toppings. This week, late season peaches are having a special moment. We can't resist eating them in each meal. Blue cheese, a few pieces of spicy salami and fresh basil with the sweet juicy peaches make this week’s pizza one of our favorites. Before this pizza adventure, we might have said "just pick up store bought pizza dough." And we still wholeheartedly suggest that in a pinch. 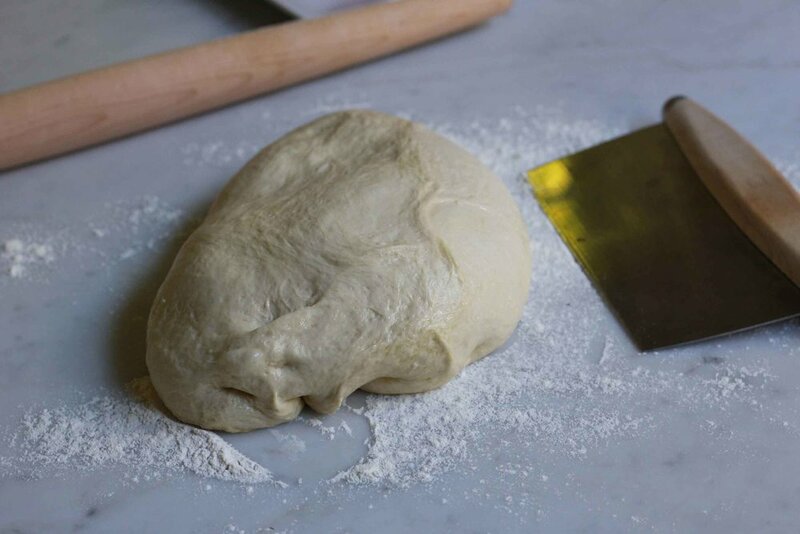 But, if you have five minutes to knock out this dough, we've got to be honest, it's really phenomenal. Whether it's the additional glug glug of olive oil that makes it more moist and elastic, or that secret dose of love that comes from something handmade, making your own dough is highly encouraged. It will take about an hour for the dough to rise (though you can certainly go longer), but that seems like the perfect length of time to tie up loose ends in addition to getting your toppings prepped. At this moment, the combo of juicy peaches and fresh basil as the start to today’s pizza topping is what seemed perfect. We're all about having flavors mingle and dance in your mouth. So if we're introducing something sweet to a savory dish (like these succulent peaches), we love to put it up against something spicy (like this molé-seasoned salami). So that the tension between those flavors is balanced, we add tangy (like the blue cheese). Basil adds a freshness that caps off the balance of all of these components. A sprinkle of coarse salt, a grind of fresh pepper and a drizzle of olive oil ensures that no one component is overpowering, but the combination is sure to please. Like most of the recipes we share with you, we suggest to have your ingredients prepped and ready to go before the cooking begins. Line up your toppings by the side of the grill. Once your pizza dough hits the grill, close the lid immediately. In under three minutes, you'll already be half-baked and slightly charred. Use a pair of tongs to flip the pizza. Quickly add your toppings and close the lid again to warm everything up and melt the cheese for just a few minutes. Depending on the size of your grill, you'll likely need to work in batches. A couple of pizzas at a time might be just right so the process doesn't get out of control. Make sure you let the grill heat up in between batches for best results. As we transition into cooler autumn evenings, the simplicity of this recipe's technique will allow us to hang on to the pleasure of outdoor meals. Let us know what topping combinations you create as ingredients at the farmers' markets start to rotate in the coming weeks. We will likely alternate between experimenting with new flavor combos and going back to another revered favorite of Pizza Margherita with fresh mozzarella and basil along with a few red chili flakes to liven up a tasty tomato sauce. Stir in olive oil, then add flour and salt. Mix with paddle attachment until combined to form a shaggy dough. Knead the dough on low speed with a dough hook for about 5 minutes until the dough feels smooth. It will be very sticky and moist. (Alternately, knead by hand for 7-8 minutes.) Place the dough in oiled bowl. Cover it with plastic wrap and put it in a warm place to rise until doubled, 1 to 1-1/2 hours. Preheat gas grill on high temperature for 15 minutes. 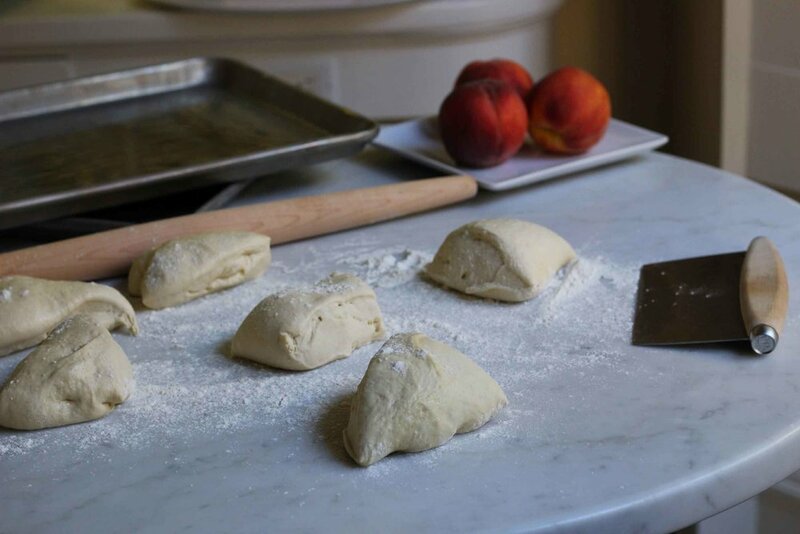 Divide the dough into 6-8 smaller pieces. Roll each one out on a floured surface. Brush dough on both sides with olive oil and place on sheet pans. Prep desired toppings. Place by the side of the grill so they are ready to use. Depending on the size of your grill, work in batches if needed. 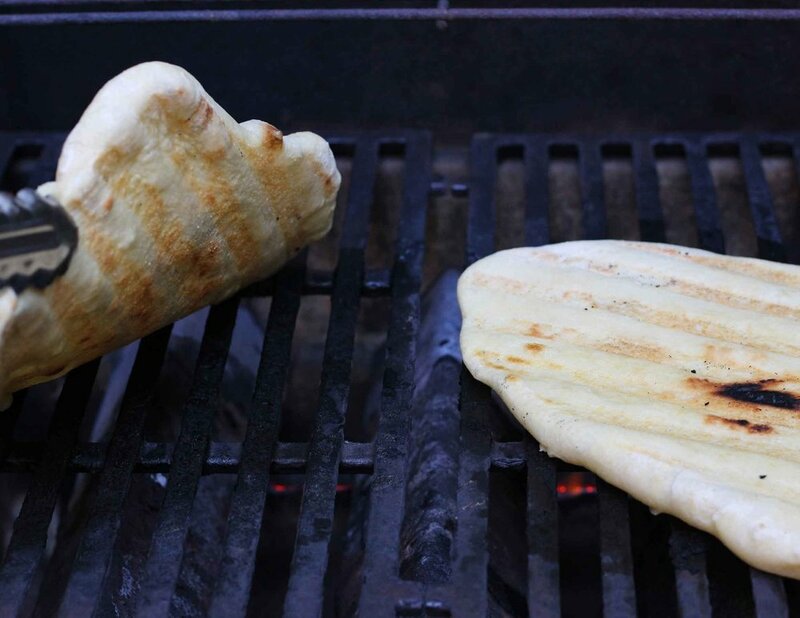 Place individual crusts on the grill. Close the lid. Let crusts grill for about 3 minutes until bottom is slightly charred. Use tongs to flip crusts over. Quickly add your toppings to the grilled side. Start with peaches, add salami, finish with cheese and basil. (Or if making Pizza Margherita, first spread sauce then add other toppings.) Close lid and continue to cook for another 3 minutes or so, until the cheese is melted and the bottom of crusts are cooked. Using tongs, carefully slide the finished pizzas back onto the sheet pans. Drizzle with olive oil, season with salt and pepper. Pay attention to your grill, since no two are the same. Move your pizza around to spots that are just the right temperature for the job.